What is the Architecture of a Business? Business Architecture is a total concept of a business structure or business system, containing constructive, operative and decorative concepts. A business structure is a business system with construction (like departments), operations (like processes) and decoration (like imago, ethics code and transparency). A business (structure) is an organization or economic system exchanging goods, services or products for value. An architecture in the method Dragon1 is only a real architecture when it contains a coherent set of constructive, operative and decorative concepts. A concept is another word for approach, way of working or idea, abstracted from its implementation. Every concept has one or more working mechanisms. The working mechanism of a concept, is the principle of a concept. Read more about the definition of business architecture here. What is NOT Business Architecture? Unfortunately there are architecture frameworks and approaches that define business architecture in completely confusing ways. For instance, business architecture is defined as DESCRIPTION or DOCUMENTATION. But that would mean that without describing or documenting the business architecture, that there is no business architecture. That, of course, is nonsense. Other definitions of business architecture say that it is about the interaction between business strategy, organization, functions, business processes, and information needs. But this excludes having a business architecture without strategy, organization, functions and business processes. For example, a kid selling apples door by door does not have a strategy, organization, function and business process. But it does have a business architecture, namely: Endearing Charm Based Business. If you are lending the word architecture from the field of building architecture and place it in the world of organization and innovation, there is no reason at all to change the meaning of architecture (unless you do not fully understand or know what is architecture and what is an architect). In the past decades this was done by many architects and frameworks: they changed the definition and meaning of architecture from 'total concept' into 'total logical structure'. Just look up all the definitions on enterprise architecture. They often address the logical and physical level, but not or hardly the conceptual level. Dragon1 undo's all this. Dragon1 as open EA Method defines architecture as special total concept and architects as designers of special total concepts. It is not that easy for everyone to do at first conceptual design, next logical design and after that physical design. And finally supervising the realization of a structure using that total concept. A concept is another word for approach, a way of working or idea, abstracted from its implementation. A business architecture MUST mention all the concepts used in the business architecture, so that includes naming also the fundamental concepts used. Note that per business function like procurement, development, sales and delivery, one can explore many concepts. Be sure to reference literature and books. Before you use a concept in your architecture, be sure you know of the first principle of the concept very well. The first principle is the enforced way the whole concept works, producing results. (This is also a specific Dragon1 open EA Method definition that differs from mainstream Enterprise Architecture). Every organization will detail the design and implement these concepts different in their structure. Every concept at a logical level consists of elements and at physical level consists of components. At the implementational level, it consists of technical products (the products you buy from suppliers). This is a visualization of the Dragon1 Business Architecture Diagram Template. 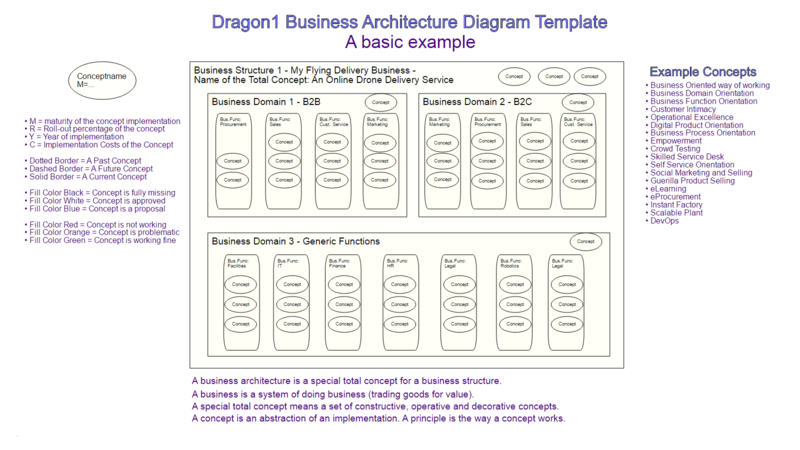 If you create an account on Dragon1 and log in, you can use this template to create business architecture diagrams. Better and Faster. This template will help you to create a business architecture. Of course, there are many other different views and visualizations to create, like design sketches and artist impressions of the total concept, that may be more appealing to your stakeholders. However, you always have to create this diagram as a formal documentation of your business architecture. Do you want to create Business Architecture Visualizations yourself?